Full Keto and Sugar Free Shopping List! As I have continued on my sugar free journey, there are a few lessons I have learned over and over again. The first lesson is, the key to weight loss and overall health is to control your insulin response when you eat. That means no carbs, sugar, grains, etc. The second lesson is to always have a wide variety of tasty food on hand so there is no temptation to eat junk food. Cauliflower – Cauliflower is probably the most important and versatile veggie you should keep in your crisper. You can shred and steam it and make a rice substitute, you can steam, puree and mix with and egg and almond meal to make a pizza crust, steam and mash them for a mashed potato substitute, and last night I made Cauliflower tots to go with my burger. Almost any carb-y food you used to enjoy can be subbed for a cauliflower, with one exception. Rutabaga – For french fries, instead of reaching for a potato, try a rutabaga instead. Cut the ends off and peel it, then cut into french fry shapes. But on a baking sheet with a little butter and salt and cook until soft. Through some sugar free ketchup on the side and eat up! Just keep in mind that they aren’t totally carb-free but they have about a third of the carbs of potatoes making them the better option when you just absolutely have to have fries. Bell Peppers – Stuff them with meat, or slice them and use as chip substitutes for dip, or use them in any kind of veggie saute. Jalapenos or other hot peppers – Not only do they give your food a tasty kick but that capsacin is great for sore joints. Zucchini – Great in sautes or buy yourself one of these bad boys and make it into noodles for your spaghetti dishes. Yellow Squash – another great sauteingveggie or slice them really thin and bake them for something a little crunchier. I use a mandolin slicer for mine. Onions – They have a few carbs but I can’t imagine my recipes without them. I put them in absolutely everything from my breakfast veggie scramble to whatever I’m doing for dinner. Garlic – Also has a little carbs but adds flavor to anything. Cucumber – Great for salads. Slice them with some purple onions, dill and greek yogurt for a fantastic cucumber salad or just slice them up with a little oil, vinegar and salt. Mushrooms – Go with burgers or in sautes or buy them whole and stuff them with some cream cheese and herbs. Brussels Sprouts – My wife LOVES Brussels so we always keep them around. Cut them in half, cook in a skillet with butter and season with Tajin. Very tasty. Celery – I pretty much just use celery as a nut butter delivery system. Smear a little almond butter on one and chow down for a tasty snack. 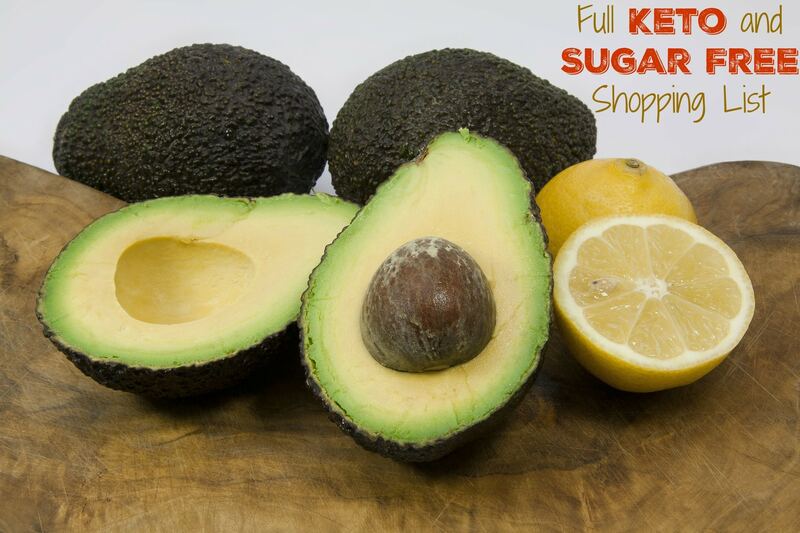 Avocados – A must have for the low carb, high fat lifestyle. Never a day goes buy that I don’t have one of these on a salad or as a side or smashed up with some tomatoes, lime juice and salt for a quick guacamole spread. Chicken – There’s not a whole lot you can’t do with chicken. Don’t be afraid of the skin, either. You want that fat. Beef – Grill that steak with the huge strip of fat in it and buy that cheap 27% fat hamburger meat. You want that tasty fat. Pork – Anything from chops to bacon to ham, it’s all good. One word of warning about the cured meats, watch out for hidden sugars. I usually buy low sodium bacon because there is frequently no added sugar to the recipe. With ham, sometimes the best you can do is get a ham that has been sweetened with dextrose instead of a sugar containing fructose. It’s still not wonderful but if you have to have ham, it’s a lot better than fructose. Fish – Salmon is about the only fish I will eat anymore but any fish is good. If you can get wild caught salmon over the farm raised stuff, absolutely do that. Canned tuna is also ann awsome thing to keep around for quick lunches. Deli Meat – Just check the ingredients for added sugar. Stay away with anything with honey or brown sugar added. Cheese – If you are eating low-carb and find yourself not losing weight, cheese is the first thing I would look at. Some people have a hard time losing weight while eating cheese. Otherwise, eat as many different kinds as you want. Cream Cheese – This is great for cooking. A little cream cheese overbaken chicken or stirred into spinach while steaming it is a great way to add a tasty fat to your dinners. Eggs – The perfect food. Eat them up and hard boil a few to have as a snack. Whipping Cream – Put it in your coffee, whip it into homemade whipping cream and use it as a topping, or whip it until it hardens into butter. Butter – This is a staple. I can’t imagine cooking without butter. If you have trouble with the lactose, consider getting clarified butter, or ghee. Olive Oil – If you are going to cook with oil, I recommend saturated fats. If you would like to read more about why, I recommend Toxic Oils by David Gillespie. Apple Cider Vinegar – Be sure you get the kind with “The Mother” for the maximum health benefit. Mix it with the olive oil for a great salad dressing. Spices, Herbs and other seasonings – Be sure any spice blends you get have no added sugar and then be sure to flavor your food well. You want to make eating as enjoyable as you possibly can and the easiest way to do that is to use herbs and spices. And of course grab the salt and pepper. PREVIOUS POST Previous post: Is Metformin the New Lifespan Longevity Wonder Drug? NEXT POST Next post: What’s Sugar Free and Keto Friendly at Wendy’s?